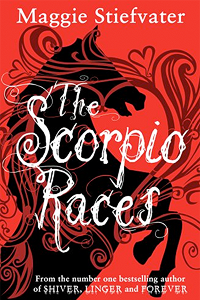 The Scorpio Races is different from all the other YA lit currently floating around; no dystopian novel trying to ride on the success of The Hunger Games, no predictable and sickening love trios, no sparkling vampires, werewolves, zombies, fairies or other over-used paranormal creatures. Instead the only supernatural creatures present in the book are the capaill uisce; an invention by author Maggie Stiefvater based on a wealth of different horse legends and as such completely original. I am not normally a big fan of horses or a book that focuses on these creatures, but killer water horses off the coast of Ireland? I can get behind that! The title is slightly misleading as the novel isn't about the races so much (the actual races in fact take up a mere 10 out of 400+ pages), as it is about what comes before the big day. In dual narrative it focuses on two of the contestants, Kate "Puck" Connoly and Sean Kendrick, and their preparations for the race. As they train together and slowly get to know one another the reader gets a chance to get to know the characters and find out what drives the people of Thisby to continue on with such a dangerous sport. Unfortunately I did not truly believe the instant connection between Puck and Sean. Neither seemed very forward or overly interested in the other at first. Sean has his capaill uisce Corr, Puck has her brothers (Finn, and to a lesser extent Gabe). The only thing Sean and Puck have in common is that they both enlist in the races and do not want to train with the other contestants. However, over time the two grow closer towards each other and their attraction becomes more believable. The Scorpio Races is a story of a small island seeped with magic, superstitions, small minded people and sticky November cakes. Of loyalty and friendship. First love and growing up far too young. But mostly it's a story about two young adults trying to figure out who and what is truly important in life and what is worth taking a risk for. Also, there are killer water horses. Enough said.